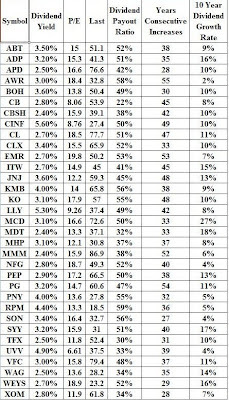 As a dividend growth investor, two of the best dividend lists for further research that I have focused on have been the S&P Dividend Aristocrats and the Dividend Achievers Indexes. The first list focuses on stocks which have increased dividends for 25 consecutive years in row, while the second list focuses on stocks which have consistently raised distributions for over one decade. The Dividend Aristocrats index has supposedly outperformed the stock market over the past five years. In my research I have uncovered many dividend stocks however which have raised dividends for more than 25 years in a row, yet they are not included in the Dividend Aristocrats Index. I discussed this in dividend conspiracies. The limitations behind the dividend aristocrat’s index are that first a company has to be included in the S&P 500 before it qualifies. In addition to that, S&P requires minimum market capitalization of $3 billion and an average daily trading volume of $5 million. This means that even if a company has managed to raise annual dividends for 25 years in a row, it might not be included in the elite dividend index if it has a low market capitalization or that it is relatively illiquid. As a dividend investor, the last two criteria are irrelevant to me. Sonoco Products Company (SON) provides industrial and consumer packaging products, and packaging services in North and South America, Europe, Australia, and Asia. Weyco Group, Inc. (WEYS) engages in the retail and wholesale distribution of men’s footwear in North America, Australia, South Africa, the Asia Pacific, and Europe. It offers men’s casual, dress, and fashion shoes under Florsheim, Nunn Bush, Stacy Adams, Brass Boot, and Nunn Bush NXXT brands. Bank of Hawaii Corporation (BOH) operates as the holding company for Bank of Hawaii that provides a range of financial services and products in Hawaii and the Pacific Islands. The company operates in four segments: Retail Banking, Commercial Banking, Investment Services, and Treasury. Medtronic, Inc. (MDT) develops, manufactures, and sells device-based medical therapies worldwide. The company operates in the following segments:Cardiac Rhythm Disease Management , Spinal, CardioVascular, Neuromodulation, Diabetes, Surgical Technologies and Physio-Control. American States Water Company (AWR), through its subsidiaries, provides water, electric, and contracted services in the United States. The company engages in the purchase, production, distribution, and sale of water in California; and the distribution of electricity in San Bernardino Mountain communities. National Fuel Gas Company (NFG), through its subsidiaries, operates as a diversified energy company primarily in the United States. The company operates through four segments: Utility, Pipeline and Storage, Exploration and Production, and Energy Marketing. Piedmont Natural Gas Company, Inc. (PNY), an energy services company, distributes natural gas to residential, commercial, industrial, and power generation customers in portions of North Carolina, South Carolina, and Tennessee. Mechanical investing is not what I am writing about here. It is just the beginning step in order to bring the list to a manageable list. The rest is up to investor to determine whether a certain stock is a buy.